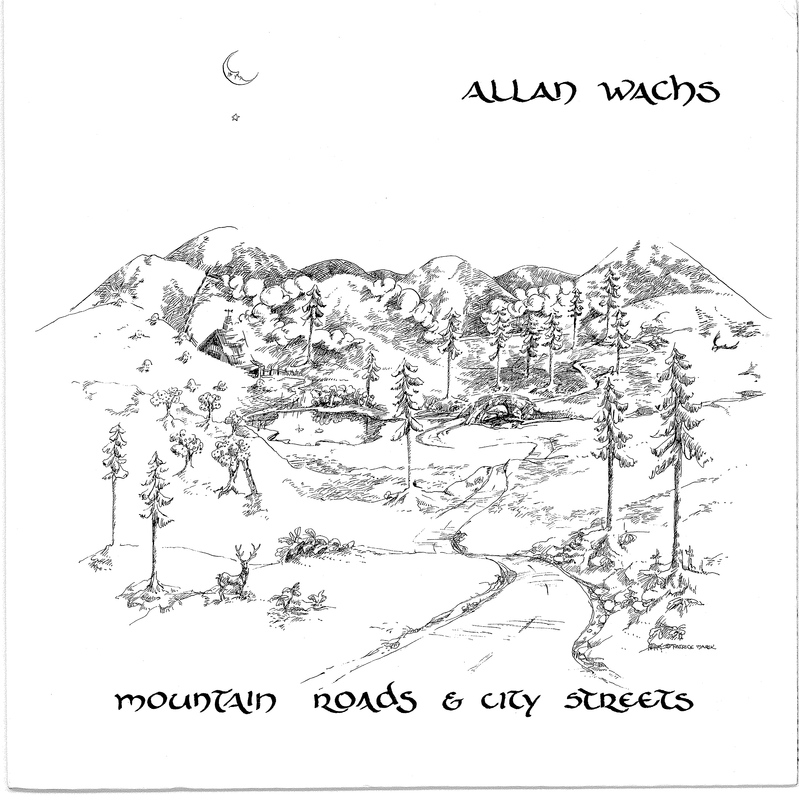 I first came upon Allan Wachs’ 1979 release, Mountain Roads & City Streets, when I was browsing through thousands of album releases on an online music store. Browsing for music in this somewhat aimless way has become a routine activity for me. From personal experiences looking through such archives both digital and physical, I’ve learned to refuse to believe that the number of records an artist has sold or distributed has a direct relationship to the quality of the music therein. I can spend hours at a time browsing like this because it feels like being a miner who knows that there’s unclaimed gold underneath all the layers of useless dirt. At that time I was looking through 70’s rock releases, an easy favorite period of mine. Honestly, what initially drew me to this album was its cover. Featuring a simple black and white landscape pen sketch of a road leading into a mountain forest, with a decidedly passive crescent moon hanging in the corner, the cover didn’t remind me of the type of art usually featured on albums of this time. It was simple, yet personal. Even old-school. Qualities which I came to hear reflected in the contents of the songs. The album opens with what has become my favorite song, “Adventures of the Invisible Dog,” which is at heart a break up song. But it begins as a relaxed, melodic piece with only a hint of somberness. It’s a great groove and melody, and it’s not till the last line in the chorus, “It’s so lonely without you,” that you really understand it’s a break-up song, and that lyrical arrangement is so effective and captures perfectly those feelings of reflective loneliness and quiet existential madness that come at the end of a relationship. In terms of style, it sounds like Jim Croce meets Pavement. Something about Allan’s music sounds both of and ahead of its time. It would be at home in the 70s or today. And this is a truly timeless song that a shamefully small number of people have been privileged to hear. Other favorite tracks are “Anna Lena,” a very laid-back love song that pairs well with an accompanying flute, “Dancer,” a neat little folk waltz, “Mountain Man Breakdown,” a bluegrass song that reminds me of The Grateful Dead circa Working Man’s Dead, and “Mountain Roads,” a straight-up country rock number that recalls The New Riders of the Purple Sage. Mountain Roads & City Streets has become one of my favorite albums. What I love most about it is how personal the songs feel. They sound genuine and introverted; close to the heart of the writer. Though the tracks draw on well-established styles, there’s something about them that feels identifiably unique. Perhaps most importantly, this album has been with me through some tough times. It’s been a companion of sorts, and I will always love it for that. It’s a shame that more people haven’t heard Allan’s music. If today’s independent label-driven music scene had existed in the 70’s to the extent that it does today, I imagine it might have seen a far wider distribution. Every once in a while an album from the past gains a cult following. I’ll keep my fingers crossed that it happens with this one. Meanwhile, I feel like I’ve discovered a secret treasure that I’m happy to keep for myself. If you’ve never heard “Chinese Music”, or his twisted version of “If i listened long enough”…. well, you just haven’t lived. Thanks for your insight, and generosity in sharing this with us.